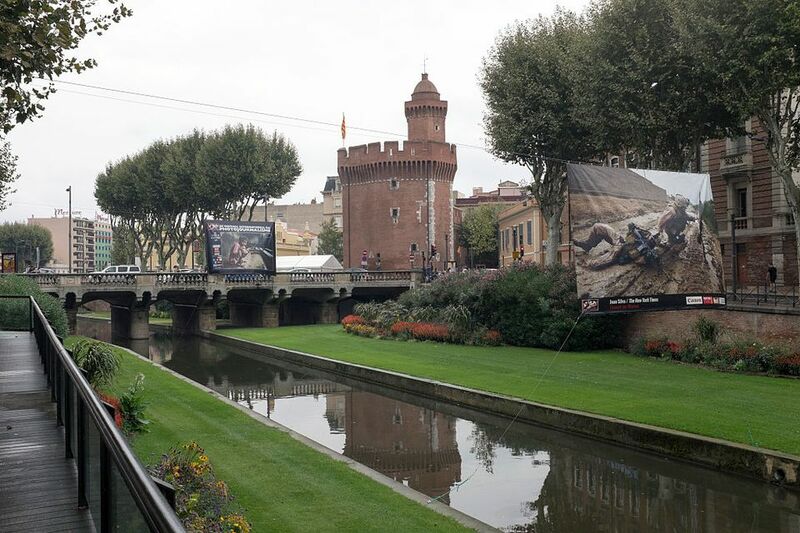 Perpignan, the second city of Catalonia, the region that encompasses France and Spain, is a wonderfully lively city. Now in Languedoc-Roussillon, the French Catalans still keep a separate identity from the rest of France with their own language and the national colors of yellow and red that you see everywhere. Perpignan is a great city to stroll around, taking in the old streets. Don't miss the folk culture exhibits which you'll find at the 14th-century gateway of Le Castillet with its Casa Pairal museum. Dine on seasonal mushrooms and seafood at La Galinette (23 rue Jean-Payra, tel. : 00 33 (0)4 68 35 00 90), or take a more Catalan meal at Ail I Oli (12 allee des Chenes, parc Ducup, tel. : 00 33 (0)4 68 55 58 75). Perpignan is near the gorgeous Cote Vermeille, or Vermilion coast, with its sandy beaches that run down to the azure blue Mediterranean Sea. Beziers in southern Languedoc is a delightful city that rises up a steep hill to the Cathedral St-Nazaire. Looking more like a castle than a church, the Gothic structure dominates its surroundings. The original building was burnt and destroyed in 1209 when Beziers was sacked by crusaders bent on destroying the Cathars, a handful of whom were hiding in the church. The Priest refused to hand the heretics over, and 7,000 people were massacred. "Kill them all", was the chilling order, "God will recognize his own." Today, the scene is peaceful, and from the viewpoint you’ll get a panoramic, bird's eye look at the winding medieval streets, the cathedral cloisters and the landscape of vine-covered hillsides. The area is well known for its wines, as well as being the birthplace of the great Resistance hero, Jean Moulin, (whose museum in Paris is well worth a visit), for rugby and for its mid-August feria. Just inland from the sea, Bezier is close to one of France’s most famous resorts, Cap d’Agde, the capital of nudism. Cultured, lively and with beautiful old districts that cry out to be explored, Montpellier is one of France’s most attractive cities. It’s easy to walk around the spacious, largely traffic-free center, taking in the 17th and 18th century mansions (hôtels), the gardens of the Promenade du Peyrou park, the place de la Comedie dominated at one end by the splendid Opera building, and a wealth of good museums. There are plenty of good restaurants and bars and cafes lining the squares, and there’s a lively music scene. The beaches of La Grand Motte and the wonderful fortress town of Aigues-Mortes to the east and the former fishing town of Sete to the south west are all worth a day trip. Arles' remarkably preserved Roman arena, Les Arenes, right in the middle of the city, is one of the many attractions of this Mediterranean town that lies in the Bouches-du-Rhone region of Provence. Fiercely proud of its Provencal culture, the UNESCO World Heritage Site ​​has stunning buildings to explore, interesting and varied museums and historic medieval streets. Vincent Van Gogh arrived in the late 19th century and persuaded Paul Gauguin to join him. Arles’ position as a city that attracted artists was ensured. Of the many sights in Arles, don’t miss the superb Roman Amphitheatre, the Roman arena, the cathedral with its wonderful 12th-century Provencal stone carving over the doorway depicting the Last Judgement, and its serene cloisters. The museums show you life in Provence and Arles, and the Fondation Vincent Van Gogh has works by contemporary artists inspired by Van Gogh, such as Francis Bacon, Jasper Johns and David Hockney plus photographs by Cartier-Bresson and Doisneau. The great Mediterranean seaport of Marseille is France’s oldest city and vies with Lyon as the second largest city of France. It’s a hugely lively, buzzing place with a long history that takes in glory and gloom, plagues and pageants, boom and bust. Today Marseille is busy reinventing itself, with plenty of new building projects along the seafront such as the Museum of European and Mediterranean civilisations. And in 2013 Marseille will be European Capital of Culture, along with Kosice in Slovakia. It’s a far cry from the days when films like The French Connection linked Marseille with drugs and crime. Marseille is famous for its football team, its food (particularly the famous sefood stew of bouillabaisse), its wide range of festivals, Marseille soap and Paul Ricard pastis. It’s full of attractions, from the Old Port to the notorious Chateau d’If and its most famous prisoner, the fictitious Edmond Dantes in Alexandre Dumas’ Count of Monte Cristo. Glamorous and glitzy? Is St. Ttopez still one of the best resorts on the Mediterranean, or past it? Opinions are divided about this famous town which Brigitte Bardot once graced. Of course people-watching ranks high here, from both café terraces and on beaches like the Plage de Pampelonne. But there’s more than that to St. Trop, as it's usually called. You can wander wander around the old port or take a longer walk around the peninsula; visit the wonderful Musee de l’Annonciade for its neo-Impressionist and Fauve works then go shopping for international designer names or Provencale crafts. There's life in the old girl yet. Cannes may be best known for its annual Film Festival, but there’s a lot more to this sophisticated Mediterranean town than the red carpet and the international stars who descend on the town every May. A stroll along the Boulevard de la Croisette takes you past the luxury palace hotels the place is famous for. With the glittering blue Mediterranean beside you, walk to the marina with its fabulous yachts. The old town, Le Suquet, climbs up a steep hill from the Old Port. The streets are full of restaurants and bars; make your way up to the 11th-century Tour du Mont Chevalier for the Musee de la Castre, an odd and fascinating 19th century collection of ethnographic items from around the world. Antibes is a wonderful Mediterranean resort tucked between Cannes and Nice. Its old town invites you to wander through the pretty flower-filled streets down to the marina, one of the most spectacular in the Mediterranean with its multi-million dollar yachts. The daily flower and vegetable market is full of the scents and tastes of Provence; walk a few yards to the chateau where the Musee Picasso houses a very good collection of the artist’s ceramics, along with works by some of his contemporaries. To the south lies the Cap d’Antibes with its small beaches, a lighthouse and church dedicated to sailors up a small hill, splendid old and new villas and great hotels like the Hotel du Cap Eden Roc. In contrast, neighboring Juan-les-Pins is glitzy and modern, famous for its annual Jazz Festival held every July on a stage right by the sea. Nice is a great city, vying with Marseille as the second city of France. It attracts both those after the good life and those after culture with a selection of marvelous museums. You can see works by the Impressionists and other artists who flocked here from the 19th century onwards, some in the houses they lived in, others in places like the Fondation Maeght. A walk along the Promenade des Anglais takes you past some of the most gracious hotels in France. In the heart of the old town, the Cours Saleya fills each day to overflowing with stalls selling Provencal fruits, preserves, olives, vegetables and fruit. Nice is a food lovers’ paradise, a city of bistros and brasseries, of tempting boulangeries and fromageries, and very good cooking courses/market tours. The capital of the tiny principality of Monaco punches way above its diminutive weight. It's mainly known for its royal family (and the late Princess Grace), its scary Formula 1 Grand Prix around the streets of the town, and as a tax haven with more millionaires per square inch than most other such haunts of the fabulously wealthy. But don't dismiss it as just another resort, Monte Carlo also has a great Oceanographic museum with an aquarium of rare fish, the Prince of Monaco’s vintage car collection of 100 classic models, as swish as any prince could want, and a whole lot more attractions to suit every taste. And if you want to gamble, the very ornate and splendid Casino de Paris waits you custom.